The Spectrum 22 Awards were presented May 23 in Kansas City, MO as part of Spectrum Fantastic Art Live. Images of the winning entries can be viewed here. Over 1100 artists, patrons, and fans attended the ceremony, which included an introduction by Spectrum Director John Fleskes, a memorial video commemorating creators that had passed away in the last year, and aerial performances by Voler: Thieves of Flight. The awards were completely redesigned and sculpted this year by Kristine Poole, with appropriately gold or silver patina by Colin Poole. 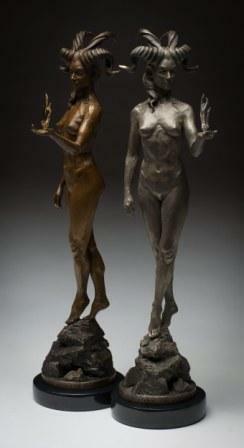 The 15-inch tall statues illustrate the symbol of the artist’s Muse and are cast in bronze with either silver or gold accents. The Pooles also designed, sculpted, and presented the first Spectrum Rising Star Award to a young artist fresh in their career who was exhibiting at Spectrum Fantastic Art Live. The Spectrum 22 jury, Justin Gerard, Virginie Ropars, Greg Ruth, Annie Stegg Gerard and Dice Tsutsumi, determined the Silver and Gold winners. The Spectrum Advisory Board also selected the 2015 Grand Master Honoree. Spectrum: The Best In Contemporary Fantastic Art was founded in 1993 by Cathy Fenner and Arnie Fenner. Creators from around the globe participate in the competition each year. Last year John Fleskes became director of the competition and editor of the annual, and Flesk Publications the publisher of the book. This entry was posted in Awards and tagged Spectrum Fantastic Art Awards by Mike Glyer. Bookmark the permalink.